Whether you're on the go or just hanging out at home, the Weber Q Portable Cart is a smart choice for outdoor cooking. The cart design allows you to go from grilling to transport mode with the push of a button, and it includes durable features like all weather wheels and built-in tool hooks. Some assembly required. Protect your TravelQ TQ285/PRO285 portable gas grill with this high quality grill cover. This grill cover is made from heavy duty PVC polyester. The material is UV protected to prevent colour fading and features a 3-inch ventilation strip to reduce moisture buildup under the cover. This cover features a large embroidered Napoleon logo to show your Napoleon pride too. Connect your TravelQ 285 Series Portable Grill to your RV and go adventuring with the ability to create gourmet meals on the go. This 6 ft. flexible hose is for use with existing RV propane tanks, and ensures that your grill has a steady supply of fuel to grill to your heart's desire. Long lasting portable stand exclusively for the Napoleon TravelQ 2225 model. Simple folding design to fit into small spaces. Durable black top with signature TravelQ orange locks. Constructed of durable, light weight plastic with steel legs. Safety locks in upright position. The focal point of any backyard dinner party, the highly portable Lodi outdoor tea cart is as functional as it is good looking. Perfect for transporting and displaying goodies, Lodi is crafted of eco-friendly acacia wood in a teak brown finish. This is a great addition to your home whether in the country side or busy city. Q Portable BBQ Grill Cart Whether you're on the go or just hanging out at home, the Weber Q Portable Cart is a smart choice for outdoor cooking. 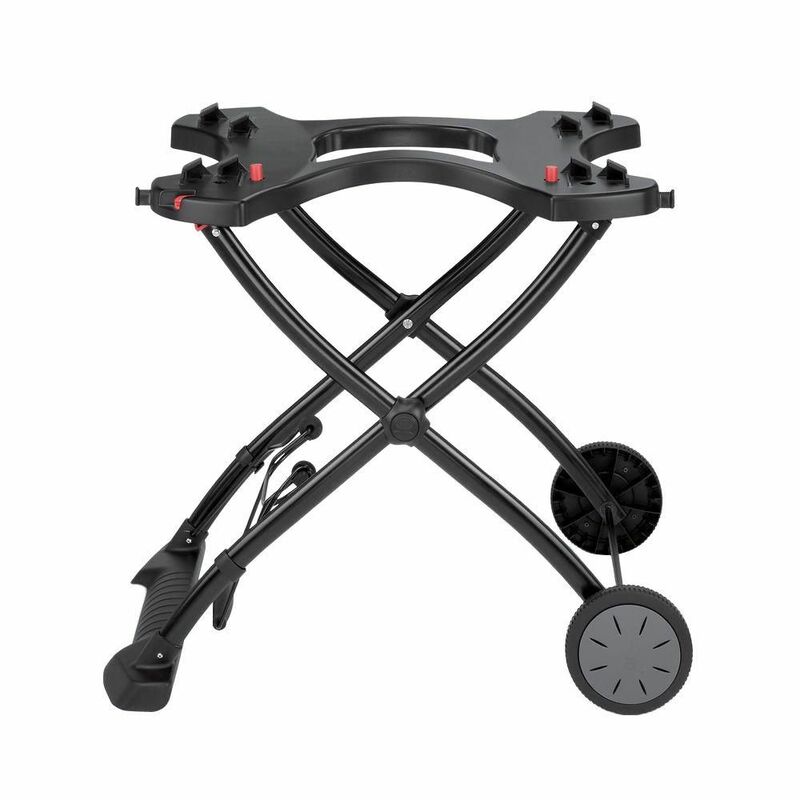 The cart design allows you to go from grilling to transport mode with the push of a button, and it includes durable features like all weather wheels and built-in tool hooks. Some assembly required. Q Portable BBQ Grill Cart is rated 4.3 out of 5 by 206. Rated 5 out of 5 by Mark from The cart was perfect. Easy to assemble!!... The cart was perfect. Easy to assemble!! Rated 5 out of 5 by Cheryl from This cart was easy to assemble and seems to be... This cart was easy to assemble and seems to be pretty sturdy. Rated 5 out of 5 by Drgrove from The grill is just right for our needs. Easy... The grill is just right for our needs. Easy to move in and out of the garage. Rated 5 out of 5 by Marjorie from Easy to assemble, love that it can be moved around.... Easy to assemble, love that it can be moved around. Fits my needs perfectly. Rated 4 out of 5 by jrschantz from Nice but not so durable I have this stand at our winter residence so it sees limited use. The orange button that captures the grill leg failed after a year. It still works, but I wish I could replace that button. Outside of that, it's a good solution to get the grill off the ground.